Feature packed, affordable and well designed. The Moto G6 represents the G series in new form, where it remains a step above its affordable competition. That said, its new premium looks come with a slightly infalted price tag, while the confusion of three G6 handsets - there's the Play and Plus, too - will potentially confuse buyers. The Moto G. It's a phone that's been at the forefront of affordable since kicking off six generations ago, back in 2013. Almost five years on the Moto G6 represents a wholly different beast; this phone shakes-up the series more than any of its predecessors. With its glossy glass rear - which looks an awful lot like the Moto X4 - and available in one of three model types - there's also a G6 Play and G6 Plus - the G6 is pushing into more premium aspirations. But in so doing it isn't quite the ultra-affordable phone it once was, priced at £219. Sure, in a market where the top-end smartphones cost nearly a grand, that might not sound like a huge amount, but it's a lot more than the first-generation G.
Moto G6 Play vs G6 vs G6 Plus: What's the difference? Moto C vs E5 vs G6 vs X4 vs Z2: Which is right for you? The G6 does cram a lot of tech into a desirable-looking shell, though, proving that affordable doesn't have to mean cheap-and-cheerful. In many ways it might be the phone to undermine the Moto X4 and keep competitors on their toes. At first glance the Moto G6 doesn't really look like a Moto G in the traditional sense. There's no plastic to be seen anywhere, no removable back, no add-on colour trims or any gimmicks of years gone by. This is an all-in-one phone that looks the part and feels great in the hand. There's even a transparent phone cover included in the box to help avoid any unwanted drops causing that rear to smash or chip. In short: Motorola has succeeded in making an affordable phone look truly premium. The slab of glass and metal looks like a slimmed-down version of the Moto X4, with the glossy glass rear aping many of the top-tier phones today. The rear also houses the slightly odd-looking circular dual cameras, again just like the X4, which is a design aesthetic we don't like much, but each to their own. 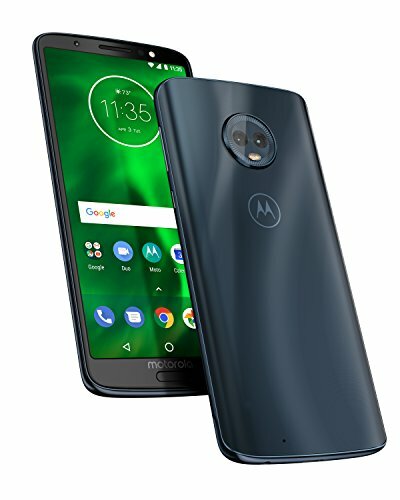 Finally the Moto G goes USB-C for fast-charging purposes (note: the Play is still Micro-USB), but this doesn't come at the cost of other features: there's still a 3.5mm headphone jack included, while a microSD card slot is available to expand the on-board storage, alongside dual SIM card slots. That mSD slot ought to be useful, as the 32GB on-board storage (Amazon has an exclusive 64GB model), the Moto G doesn't have heaps of space - although we installed 160 apps and even with some photos and music on file, still had 10GB remaining. There's also a front-facing fingerprint scanner, which features a Motorola written logo above it. We feel the logo could have been ditched to squash the phone's form factor with smaller bottom bezel for an even more refined look. Not that we're questioning the functionality of the scanner, though, as it's worked each and every time with no delay. There's also Face Unlock facial recognition, but you may find this becomes locked out by Google Device Admin (which is required at the setup phase). Once activated the facial recognition system is super easy to setup, can bypass the need for password entry, and while it works reasonably well it's not the best solution going. Still, for a budget phone this is a big flagship-like feature. In many respects the Moto G6 looks better than the Moto X, thanks to its slimmer form factor. That's partly thanks to the 18:9 aspect ratio screen, providing that modern elongated form factor. It's an IPS LCD screen, with no notch, and a fair resolution of Full HD+ (that's 2160 x 1080 pixels). The G6's IPS panel used is reasonably bright - although the Huawei P20 Pro also in our pocket during testing is far brighter - but tilt the phone to an angle and some of that contrast will fall away. The greater issue with the Moto is that when auto-brightness is switched off the battery life seems to be considerably affected, so you'd best let the phone run its own calculations. In the context of the phone's asking price, the G6's screen is perfectly ample. It's got all the resolution you could need at this scale, in a form that keeps it in line with other higher-grade competitors. It's not a flagship-grade OLED by any means, but there are few qualms with its presentation. The whole point of the G6 is affordability, so you won't find a top-end chipset under the hood. That said, the Qualcomm Snapdragon 450 platform used is capable enough, paired with 3GB RAM (4GB in the Amazon exclusive version). How you'll find this performance will depend on your experience and expectation. We've found short waits to open apps and longer waiting times than you'd get with a more powerful handset, but it never grinds to a halt, and those must-have apps and tasks - like Mail for emails or WhatsApp for messages - run no problems. It's with more intensive apps that the Moto G6 finds its limits. We've been playing South Park: Phone Destroyer, which is perfectly playable, but the smoothness of operation isn't great and the frame-rate is noticeably low in certain sections. When running Candy Crush the game can sometimes have those "fits and starts" with its animations, sometimes being inconsistent with the smoothness of playback. Given that the Nokia 6 offers a step-up Snapdragon 630 platform for the same money, the G6 feels like it's missed a processor trick here. How all this affects battery life causes a lot of variation in the G6's longevity, too. With South Park running the phone got a little warm, with the battery telling us after closing the app that only six hours of juice remained. Once it cooled off this slowly extended to eight, then 10, then 12 hours. Point being, if you do dabble in a little more intensive app use - as we have been doing for 15 minutes at a time, a couple of times a day - then the Moto G6 will push its way through 12-14 hours overall. That can seem a little light at times, as that 20 per cent mark will creep up on you by dinner time. Fortunately, however, the G6 embodies USB-C charging, with Moto's TurboCharge (think of it like a rebadged Qualcomm Quick Charge) getting energy back into the phone's 3,000mAh battery in double-quick time. Half an hour at the plug will add hours of use again. It's wired charging only, however, with no wireless charging featuring. One of Motorola's selling points is that it uses an Android operating system that's close to Google's stock, making for a clean and easy-to-use experience. There are some additional apps and additions on top, all of which are routed in the Moto app front and centre, but none that get in the way to disrupt the experience. Well, so long as you ignore the optional apps when setting up the phone from scratch. Fronting the Moto specials in the Moto app is Moto Voice, now in version 2.0, which introduces additional contextual understanding. It's like Google Assistant in with some extra strings to its bow. Say you want a late night pizza: "Hey Moto, find me a pizza place that's near to me and open after midnight" and the system will thread together those multiple query points (type, location and time) and return an answer. Whether you care for voice control is another matter, however. Moto Display, Moto Actions and Moto Key are the three aspects of the Moto app. From keeping the display on as you look at it, to silencing calls when flipping the phone, or using the device to unlock a Windows laptop when in proximity, these are all beneficial software features - all of which can be controlled individually, too. One other fun incorporated feature is Dolby Audio, accessible from a swipe down to open the shade. We love what this feature can do - there's a manual band equaliser, in addition to pre-sets for music, film and other custom settings - but do wonder if such a premium feature is relevant in an affordable phone. After all, Dolby licensing always costs cash. The last major part of the puzzle is the G6's camera. It incorporates dual lenses so it can cater for the now staple Portrait mode (think blurred background when shooting a person/portrait), which can be found separately to the main and manual cameras from within the app. Phone cameras have come on in leaps and bounds in recent times, with the Huawei P20 Pro showing just what's possible at the top of the stack. Now, the Moto G6 doesn't hit that standard by any means, but at this level it does a reasonable job. Sadly it lacks the more advanced settings of the G6 Plus, like dual autofocus pixels, as that's one area where the G6 is a little lax: low-light presents issues for focusing, while shutter lag is perhaps the biggest issue, as waiting for that "click" for a photo to be taken is a little frustrating. In fitting with the augmented reality theme, the G6 also offers Face Filters. Yup, if you want rabbit ears or the like then there's a mode for that. It's amusing when it works, but it doesn't always identify a face. And with Snapchat and other such apps already dominating this space, do we need such additions? Probably not. Still, ignore some of the extras and the shots straight from camera are rather good. We've been shooting colourful graffiti and flora in Brazil, with the colours showing as nicely saturated, while low-light conditions have come out reasonably, too, avoiding the write-off grain you'd get with older G-series phones. There might not be the absolute best sharpness or detail, but at this price point the G6 is fitting of its grade. We just wish the camera was faster in operation, as that'd make a big difference to how well it functioned. The G6 delivers the core features that people will want - dual camera, fast-charging, an 18:9 aspect ratio screen, modern glass design, fingerprint scanner - without the need to pay several hundred pounds for the pleasure. However, it could have a snappier camera, its positioning as one of three G6 phones does confusingly overlap with the Moto E and Moto X, and the battery life ought to be a little bit better, too. It might not have dual cameras, but it does squeeze facial recognition technology into a slender, 18:9 aspect ratio body. But it's the £140 price point that's crucial and will see this handset fly. It occupies the space that Moto once dominated but, in the G6, is gradually moving away from.